What do you do when your students come to class unprepared to work? How much valuable class time do you spend covering what they didn’t do or don’t know? Preparation and accountability are part of building responsible academic and professional work habits, and frequent assessment can help students establish such productive habits. Ask yourself, What goes on during class to motivate my students to prepare, and what could I do to motivate students to prepare before class? 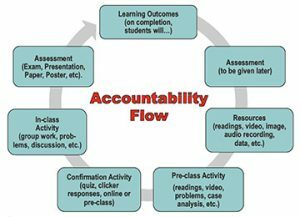 Accountability assessments can help instructors learn how closely students have engaged with materials, indicate comprehension of key concepts, and show what students missed, find confusing, and/or valuable about materials assigned. A cycle of assignment design and assessment, pre-class work, self-assessment, accountability assessment, and in-class participation contribute to student productivity and help establish a sense of responsibility and competency in the student. Frequent, low-stakes assessments help students learn new material, review previous material. Instructional technologies such as these can help assess comprehension before class, in time to adjust in-class activities accordingly. Find out more about modifying your materials to hold students accountable and encourage in-class participation. Then save your class time for the kind of meaningful work that helps students develop the skills and thinking methods of your discipline.